The premier goal kicker in TANFL football in the years immediately following World War II, Ian ‘Stumpy’ Westell was a champion spearhead for club, league and state for well over a decade. Born in Wynyard in 1925, Ian Westell played his first meaningful football for Launceston High School in 1939, some of his teammates including future Tasmanian football legends Geoffrey ‘Paddy’ Martin and Noel Atkins. Upon leaving school aged 18, Westell enlisted in the RAAF as a pilot, and while in the services he represented South Australia in a match against Victoria. Upon his discharge in 1945, Westell moved to Hobart and joined the newly-formed Sandy Bay Football Club. Standing 6’1”, Westell played predominantly as a ruckman during his initial years in senior football, including in Sandy Bay’s TANFL and State premiership triumphs in 1946. The following season he was selected in the Tasmanian squad for the 1947 National Carnival in Hobart, the first of two such selections during his career. In 1948, new Seagulls coach Ernie Pilkington decided to shift Westell to full forward, in the hope that the 23-year old could use the excellent marking ability he had displayed as a ruckman to provide the team with an effective forward target. The move proved a masterstroke – in his first season in his new role, Westell topped the TANFL goalkicking table with 57 goals, and he would spend the rest of his career making the full forward position his own. 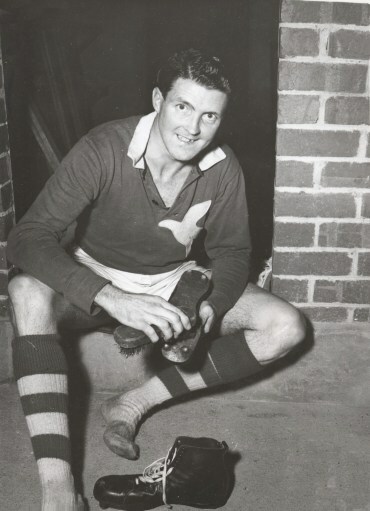 After a sensational 1949 season in which he took out the Sandy Bay Best and Fairest award, Westell again topped the league goalkicking table in 1950, this time with 83 majors; when representative matches were included his tally for the season was an impressive 99 goals – a career-high. The following season was to be the start of a period of significant injury problems for Westell. A fractured cheekbone forced him to miss a large chunk of 1951, however he returned with a vengeance in 1952, booting 81 goals in the Seagulls’ premiership year. Slipped cartilage in his knee that required surgery meant only two appearances for the season in 1953, before a clash that resulted in a bruised and haemorrhaging kidney mid-way through 1954 was so serious that Westell actually announced his retirement from football, although he would renege on this decision a few weeks later; he nevertheless had done enough already to again top the league goalkicking table with 68 goals. 1955-57 was to be the final period of success for Westell, as he again dominated the league to win the goalkicking in 1955 and 1957. He finished second behind North Hobart’s Noel Clarke in 1956, but the season did still produce a statistical milestone for Westell, as he set the record for the most goals kicked by a Sandy Bay player in a single match, booting 12 of his side’s 19 goals against New Town at New Town Oval. After nine games and 32 goals in 1958, injuries finally caught up with the 33-year old Westell, and the champion goalkicker retired after 169 games and 666 goals for the Seagulls. This figure still has him fourth on the all-time list for TANFL/TFL goals behind Wayne Fox, Peter Hudson and Allan Rait. The key to his success was his versatility, with Westell just as adept at ground level as in the air. After retirement Westell was a member of the Sandy Bay Committee for two years, and continued to serve the game as a media commentator. He passed away in 1997, the same year as his beloved club Sandy Bay themselves disappeared from the football landscape.